New offering celebrates Gilbert’s long relationship with the guitar company. NAMM 2019: Paul Gilbert has shared a video announcing his Ibanez PGM333 30th Anniversary model, celebrating the guitarist’s three decades as an Ibanez endorser. The new guitar boasts an African mahogany body, five-piece PGM maple/walnut neck and a Macassar ebony fretboard with medium frets and acrylic and abalone block inlays. Other features include three DiMarzio PG-13 humbuckers, a Gotoh GTC101 bridge, reverse headstock with gold hardware, Graph Tech black Tusq XL nut and Gotoh MG-T locking tuners. Check out the video below to see Gilbert put the PGM333 through its paces. 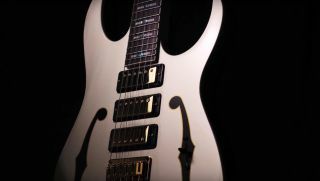 For more information, head over to Ibanez.